One of the many statues in the city. Well, by day four we were best buddies. I got smiles, and on my last morning she even handed me a plastic bottle containing a half-litre of her own homemade wine. After a full week in Abkhazia, it was time to leave. My journey passed without incident, the marshrutka driver was sane and I arrived at the border not feeling sick for once. Crossing out of a non-country can be problematic, but since I was heading back into Russia and my multi-visa was in order, I didn’t get questioned by Russian border guards like I had the week previous. I got on to an old Russian bus just inside the border, destination Sochi city centre, around 40 kilometres away, but the traffic was near gridlock so it took an hour-and-a-half. I actually had no idea where I was meant to get off, so just chanced my luck in what I thought was roughly the centre, then jumped into a taxi and finally to my guesthouse, number 47 on the street. 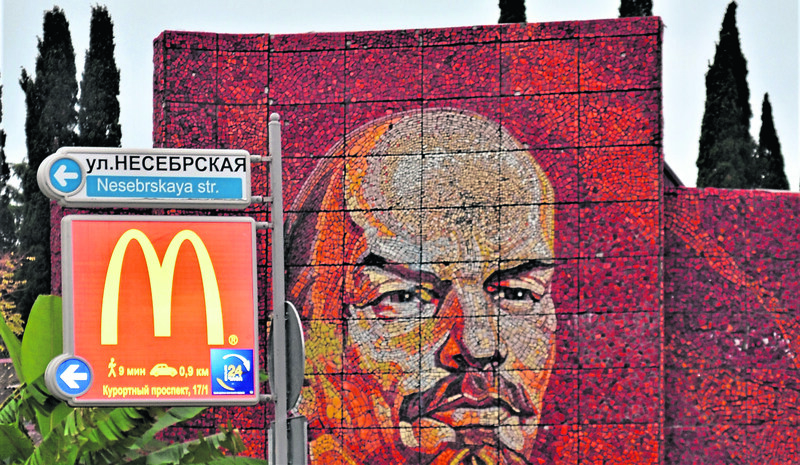 A mural of Lenin contrasts with an advert for McDonald’s. In my room, I locked the door and enjoyed a steaming hot shower, then annoyingly couldn’t find any towels. I’d call out to reception which was just along the corridor, but I couldn’t get my hotel room door open. I was locked in. As I stood dripping wet trying to fumble with the lock, the smoke alarm went off in my room – it was deafening. “Oh great, the hotel’s gonna burn down and I’m locked in my room, naked,” I said out loud. Two long minutes later, I unlocked the door and the alarm stopped. It seems the steam from my shower had set it off. Still standing soaking wet, albeit now with my pants and fleece on. I called round to reception and asked for towels. “No towels, sorry!” came the reply. I decided not to make comment – probably a wise decision – just closed the door, but didn’t lock it. Options? Not so many. I thought of using my bed sheet, but didn’t fancy sleeping in a wet sheet, so I dried myself with my fleece as best I could. It had been a long day and now at 5pm it was getting dark, so I decided to leave exploring Sochi until the morning. Around 1,000 miles south of Moscow and located on the Black Sea coast, Sochi, population approximately 350,000, is often referred to as the unofficial “summer capital of Russia”. I was in Sochi in early December, so by then, early winter in Russia. 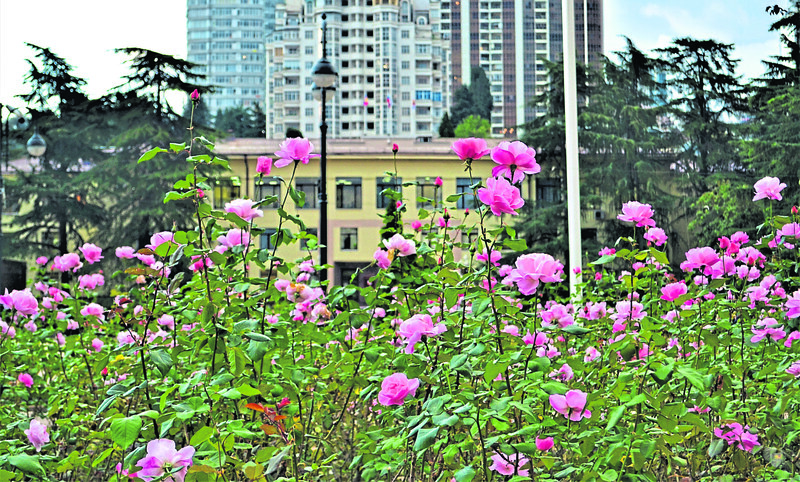 But due to Sochi’s location, it was not cold – just look at my photo of the roses still in bloom. In Moscow it was minus 6, Yakutsk minus 21, but in Sochi it was plus 16. Remarkable. With mountains, a coastline, beaches and hundreds of sunny days every year, it’s no wonder that Sochi attracts more than four million visitors annually. Pretty much unknown to the outside world, Sochi only really came to our attention when it hosted the Winter Olympics in 2014. But more about that later. Sochi first became connected to the rest of Russia by railway around 1917, but it wasn’t until 1934 under Stalin – who loved Sochi – that full modernisation took place with modern roads, theatres, parks and hotels being built, turning it into more like the Sochi we see today. 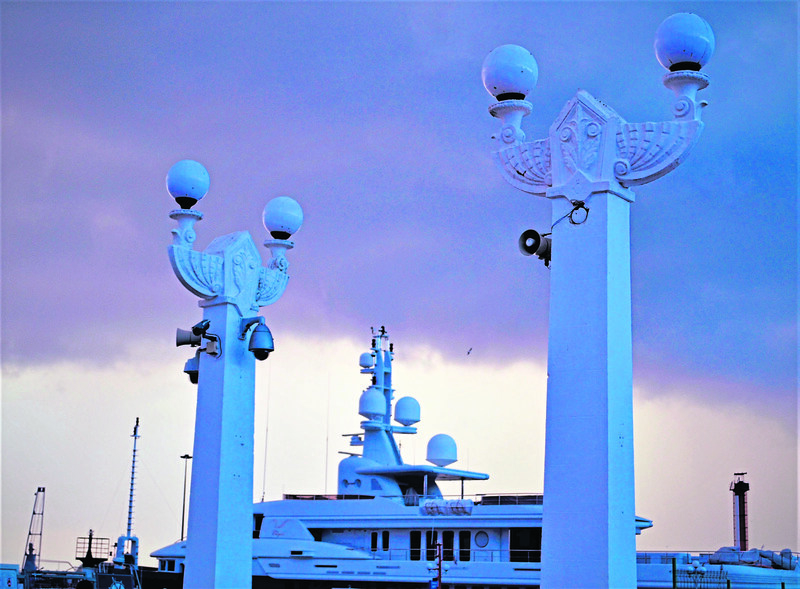 Wandering around the sea port, I spied lots of yachts with a seriously expensive price tag. Wouldn’t have seen this in Soviet times. There is very big money in Russia these days, for a few anyway. Sochi really is a fascinating mix. It’s sub-tropical, like Abkhazia, and palm trees are everywhere. It has a very different feel from, say, Moscow – much more laid back. It’s not European like St Petersburg, but has its own unique feel and much westernisation has taken place – mostly in order to “impress” its first major influx of foreign guests in 2014 for the winter games. Seeing statues or Soviet emblems in other cities in Russia feels natural, by that I mean a statue of Lenin standing in freezing Yakutsk or grey old Moscow seems apt. But here it just feels weird to see a large mosaic of Lenin with sub-tropical plants all around him… then add in the McDonald’s advertisement in front and I thought it made for a great picture. Roses still in bloom in early December. Lots of little side streets with shops I couldn’t afford to shop in, and numerous trendy restaurants all with signs in English, far too westernised for my liking. Strange to see so much written in English when 97% of visitors who come here are Russian anyway. But that all happened for the one-off winter games I guess. Even stranger is that the little timewarp, Cold War-frozen conflict zone of Abkhazia is just across the border. In downtown Sochi, at the entrance to a beautiful sub-tropical park, I came across the “feat for life memorial” which was rather impressive. 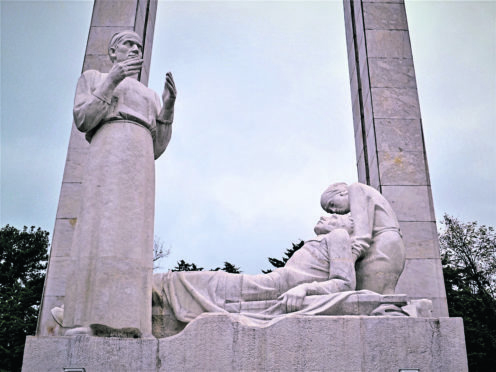 A huge memorial dedicated to the medical personnel for Sochi who helped save the lives of half a million people during the Second World War. A huge steel arc rises into the sky and underneath stands statues of a physician, a patient and a nurse. I can’t write a column about Sochi and not mention the 2014 games. The winter games, as I’m sure you’ll agree, are a poor cousin to the summer Olympics in which near the entire world competes. But that didn’t stop the Kremlin from going for it big time. When Russia won the right to stage the 2014 games, it was the first time since the USSR in 1980 that such an event had taken place on its soil. With much bad press about doping scandals, human rights and especially treatment of gay people, the Kremlin went all out to get the world to come here and see that Russia was a welcoming society. So how far did Russia go to impress? 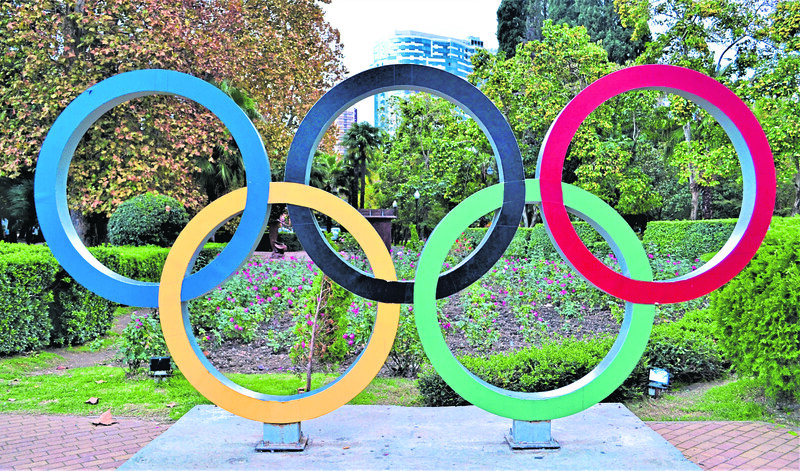 When London hosted the Olympics in 2012, which as we know is a far bigger set-up compared to any winter games, London spent around £11billion. Russia, on the far smaller winter games, spent a staggering £40billion, thus making Sochi by far the most expensive games ever. From what I’ve read and seen, there simply doesn’t seem to be any justification whatsoever for spending this obscene amount of money on a few weeks of ice hockey when millions of its people live in not exactly the best of social conditions. A memento of the 2014 Winter Olympics. Whilst many of my Russian friends were, at the time, whipped up by another dose of blind obedience and patriotism and, therefore, proud of their winter games, others have since thought along the lines of “just think what good we could have done with $50 billion if we spent it on people, housing, roads, hospitals and such like”. There’s so much more for me to see and do in Sochi, but after Israel, Palestine and Abkhazia, I’d been on the road non-stop for over three months. It was time to touch base and head home to Aberdeenshire, where I’ve actually been over Christmas and New Year, and lovely it was too!